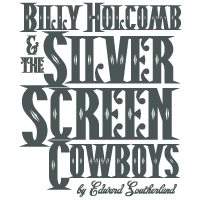 If you are of a certain age, and spent Saturday afternoons watching shadows gallop across the screen at the Rio in Denison, the Ritz in Sherman, or the Best in Bonham, you will share a lot of memories with Billy Holcomb. But what is fading nostalgia for most is still bright for him. 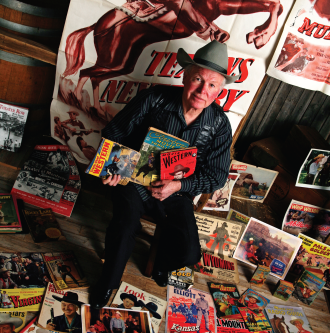 Holcomb still has everything about Gene Autry that he ever ran across. At home in Denison, he has hundreds of magazines, coloring books, posters, pictures and other printed material about his number one hero. But that is not all. While Autry is the main man, Holcomb has similar collections devoted to Roy Rogers, Allan “Rocky” Lane, Randolph Scott, and other range riders of the silver screen. But first and always foremost it was Gene Autry. When Holcomb was about ten, he started a log called the Denison Movie News. In it, he recorded information about all the movies that played in the city as well as in Sherman. It was like a diary. Using these notes as a starting place, he is putting together a book based on the movies he saw in 1950. “It brought it back just like it was yesterday,” Holcomb said. “It’ll say, ‘May 23, 1950. Gene Autry is playing at the Ritz Theater in Sherman; I rode over there to see him. When I came out, somebody had messed with my handlebars, and I had to ride back holding the little knob.’” If there was a poster, or a flyer or a hand bill, there is a good chance that Holcomb got hold of not just one, but three or four of them and squirreled them away. He collected everything, and even as a youngster of eight he had the discipline and foresight to take care of his treasures. He made notes about them, cataloged, and preserved them. He often bought several copies of magazines or comic books, cutting one up to put in thick scrapbooks and saving the others. A few years ago he wrote a monograph on the history of motion picture theaters in Denison. It was published by the Denison Heritage Society and heralded as one of the best works written on small town theaters. He has unpublished monographs on theaters in Sherman, Bonham, Paris and most of the smaller communities in Grayson and Fannin Counties. For these studies, he started with the remarkable database of his own memory and then painstakingly went back through old newspapers to piece out the histories of the Texas Theater in Sherman or the American in Bonham. He has considered taking on the entire state of Texas, and he just might do it. Through all of this, Holcomb has made a living in the insurance business, operated radio stations and worked as a musician. He has written more than 1,000 songs, mostly patriotic or gospel numbers, and many have been recorded by top performers in those fields. Starting in high school, he organized and played with a Western gospel band. Through his church association, Holcomb became active in the National Gospel Music Association, serving as its president for 15 years. In 1977, he started the Texoma Music Association, and each year the group promotes local artists in the business. Not a man to do one thing at a time, Holcomb always has several projects going at once. Currently, in addition to his book on Gene Autry in 1950, he is working on a history of the streets of Denison. He started with Austin Avenue, long ago the major route through downtown. Working from old papers and legal records, he documented each building along the street, with photographs and notes on the businesses that occupied the spaces. Finished with Austin Avenue, he moved on and is working his way through Denison’s downtown and its history. There seems to be no end to what this man knows or what his curiosity compels him to find out. And all he learns he readily shares with his neighbors, friends and anyone else who wants to know. In linage, Sherman’s Plaza topped them all. It started as the Empire in 1905, and welcomed moviegoers as the Jewel and the Washington before reopening on the north side of the square in 1939 with a shiny white façade and a new name. The Ritz, it was the Dreamland then, opened on the west side of N. Travis in the 100 block in 1908. Then it was the Gym. The rebuilt Ritz opened for business in 1935. With 500 seats it was the city’s second venue behind the more glamorous Texas. The Ritz went dark in 1956. The State was the city’s last old-style theater and the smallest. When it opened as the Fox just up the street from the Ritz in 1939. It got its new name a year later. The State was the place to be on Saturday morning in the 1940s and 50s. When the huge marquee rose over the sidewalk on the south side of Sherman’s E. Houston in 1931, the Texas Theater became Grayson County’s queen of showplaces. From the beginning, the theater entered into a unusual arrangement with its Denison counterpart, the Rialto, to always show the same feature at the same time. A fire in 1939, gutted the Texas, but it was quickly rebuilt, and if anything, was even more spectacular in its second conformation. The theater closed in 1971. The famous Texas marquee lives on as a permanent exhibit at the Bob Bullock Texas State History Museum in Austin. Denison’s Rio opened in 1940 on the north side of Main Street. It closed on December 31, 1956. It was called the Star when it opened on the south side of Main Street in the 200 block in 1913. It was the city’s top movie house until Denison got the Rialto. The theater got a new look and a new name in 1948, when it was rechristened the State, it fitfully survived until 1962. It was hailed as the “Theater Beautiful” when it opened in August 1920, and it was a title the Rialto never relinquished. On the south side of the 400 block of West Main, the Rialto stands today, the only survivor of the dozens of Grayson County movie theaters that held audiences “spellbound in darkness” for eight decades. The Superba opened 1921 across from the street from the Star. It boasted a balcony and the first popcorn machine in North Texas. For forty-three years it helped Denisonians lose their troubles in the movies’ fantasies of lights and shadows. Its marquee went black, without fanfare in February 1958, with the showing of an aptly named movie, Ghost Town. i am researching Reasor School of Denison, Texas.